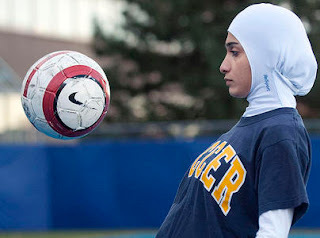 MONTREAL–First, a Muslim girl was barred from a soccer match for wearing a hijab. Then, five Muslim girls were ejected from a tae kwon do tournament for the same reason. It was 2007, at a time when Quebecers were preoccupied with how far they should go to "accommodate" the religious and cultural differences of immigrants in a secular and multicultural society. While soccer and martial arts officials cited safety concerns, many called the ejections racist, and the incidents became part of the larger controversy. Fast forward two years, and industrial designer Elham Seyed Javad has taken up the cause. SOLD! now where can I get one? Didn't Aheda Zanetti from Ahiida already invent this? Hers is called the hijood. I strongly dislike it when copycats get credit for inventing something. I agree with Anonymous 1, where can I get one? As an active muslima, I would love to have a wardrobe of these! The designer said that the product is going to be on the market soon. She is so adorable also. She said that the website is under construction.